I just picked up my SMB from winter storage today, and while driving home my belt was squealing terribly. After giving the engine some gas to head up a hill, I heard a "clunk" noise, and then about three minutes later another noise and saw a piece of the engine drop out the bottom of the engine compartment and roll across the road (never a good thing to see!). 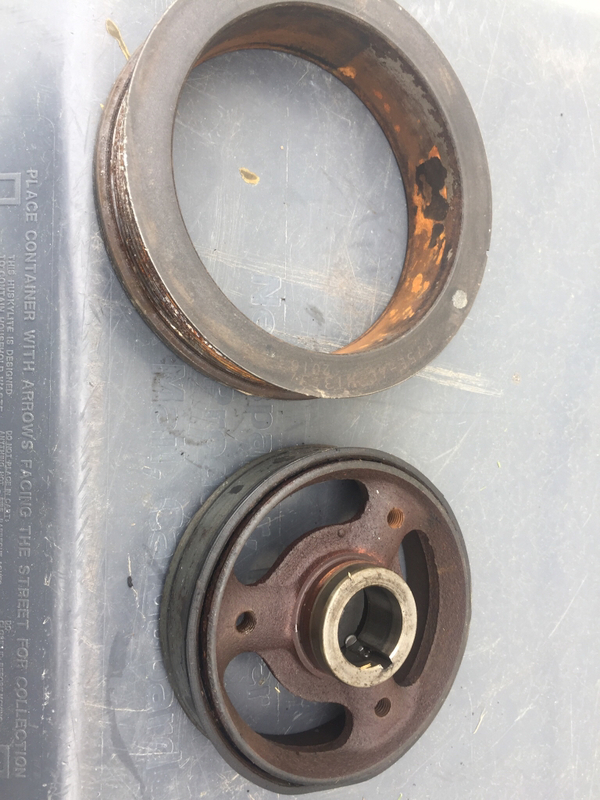 After retrieving the part, and looking it up when I got home, it appears to be part of the harmonic balancer/crankshaft pulley The part number stamped is F75E-AC, see pics attached. Ford parts catalog number seems to be XL1Z6312DA, but this is showing as discontinued in the online catalogs. I've searched online and found lots of "how to" videos for the Ford 5.4, but none for an E-van. Just eyeballing it, it doesn't look too involved to replace (just need a gear puller). Is this a repair that is doable at home, or am I better off taking it to my mechanic? I'm comfortable doing work on my van myself (starter replacement, serpentine belt and tensioners, etc.). Are there any related preventative repairs I should do/have done while doing this (water pump, maybe)? And, besides the part itself, would this have messed up anything else (timing or the like)? Van is an E-250 with the 5.4 V8, 103,000 miles. Thanks for any hints or help! Wow, that's a new one on me. Since the squealing was caused by belt slippage and the damper just drives the belt, I wonder if something else siezed up, (looks like a lot of rust on the pulley) like the alternator or water pump to cause extra stress on the damper. I once started a van after winter storage and the alternator was siezed so badly that it cracked the housing once I got it started. The hardest part of replacing the damper will be getting access, you might have to remove the fan shroud, but once you can get to it, it should be a simple removal and replacement, although you might need a puller to get it off. Be sure to check all the stuff the belt turns like the alternator, tensioner, water pump, AC compressor etc, and check the belt for damage too. Check Dorman for a cheaper part. The damper for Leggz SUV was half price. I've had two cars in the past where this has happened. The rubber vibration isolator dry rots or degrades from heat. inspect everything that arctictraveller mentioned above . you will need a harmonic balancer puller and a balancer installation tool. you can borrow these from the auto parts store. I've seen a guy break a bolt off in the crank . also don't hammer on the balancer you can cause damage to the balancer and / or the thrust bearings. here a link to the balancer you need Dorman 594-112 Harmonic Balancer ...you may shop around and get a better price. Thanks all! I might try this on my own. Pulled off the bottom cover last night and it doesn't look too hard to access. The amazing thing is that even though the pulley came off, the belt stayed on and is still under tension and works! Crazy. Took care of this over the weekend. More involved than I had hoped, but much of that was the learning curve. Not that I hope to ever do this again, but I'm sure next time will be much easier! Replaced the water pump, thermostat, antifreeze, and upper hose as preventative maintenance while I was at it. Very thankful for the free Autozone specialty loaner tools too! 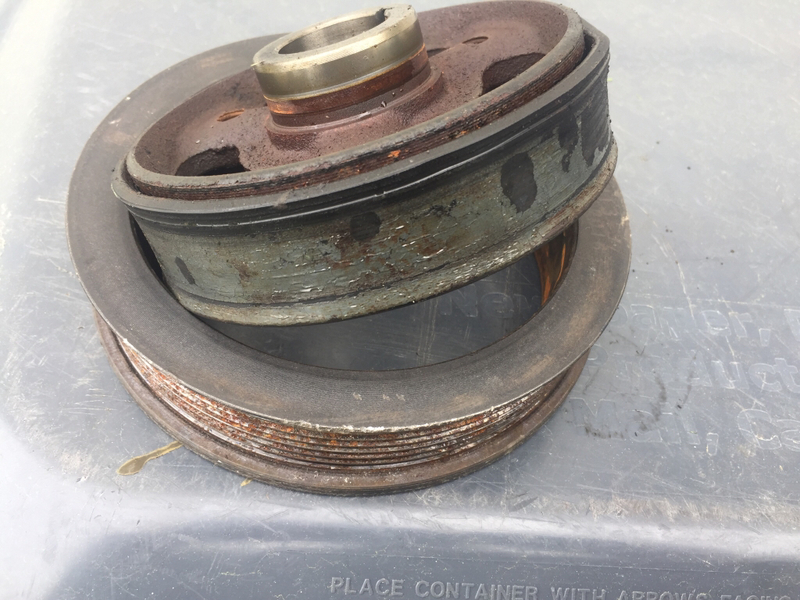 Below is a pic of the old balancer/pully, clearly showing the delamination between the layers. Glad you were able fix it.